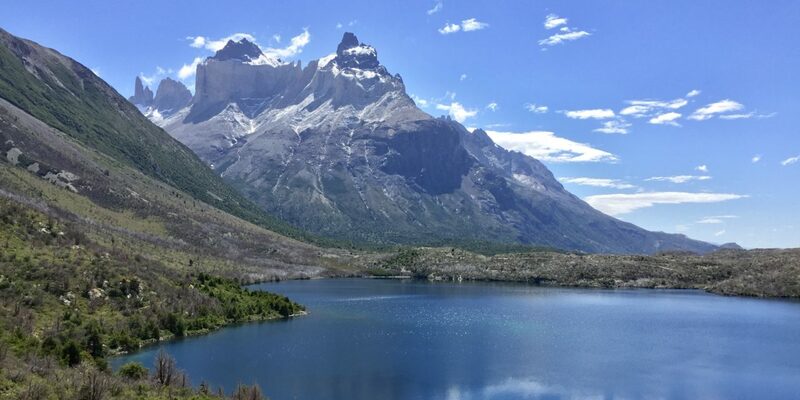 Magnificent steep mountains, glaciers, turquoise lakes, and gorgeous valleys are all in abundance on the W-Trek in Torres del Paine, the most beautiful trek I’ve ever experienced. Don’t let the long distances discourage a trip to this captivating place. All the time, effort, and sweat involved in traveling to this part of Chile is worth seeing this unreal place in person. The below itinerary is for the average 30 year old in moderate shape. If I had more time, I would have preferred to add an additional day to the itinerary, as I would have felt less rushed. The first day starts with a hike to Base Las Torres, which is an out and back 20km trek. The beginning of the hike started and ended at Refugios Torre, where breakfast and dinner was served. Renting tents and purchasing a meal plan made trekking that much easier since equipment and food did not have to be carried. After breakfast, lunch bags were picked up to bring on the hike. The lunch bags were relatively the same everyday, but they tasted amazing due to being utterly beat and famished from all the hiking. Lunch bag always included: a bottle of water, gigantic sandwich, granola bar, trail mix (peanuts, cashews, raisins, etc), an apple, and a piece of chocolate. The plan was to hike up to Las Torres, eat lunch at the top, and then come back down to the site. The hike to Las Torres was pretty amazing. It’s not extremely difficult, especially because we left the majority of our belongings at the campsite. When you get to the top, you’ll see a huge body of turquoise colored water. When you look up, you’ll see three massive granite towers. It took us about 10 hours to do the whole trip because we spent a good amount of time at the top. Plus you want to take pictures of everything along the way since everything is so beautiful. Day two started at Refugios Torre and ended at Domos & Camp El Frances, for a distance of about 13km. This was the first day hiking with backpacks since we were moving to a different camp site. The first 5km was super windy but started to settle down as time went on. Eventually, the trail gets very close to Lake Nordenskjold on the left with huge steep mountains on the right. The views of Lake Nordenskjold were unbelievable on the way to Camp El Frances. When the sun hits the water, the turquoise color radiates throughout the entire landscape. Be careful crossing some of the rivers, otherwise your foot will slip off a dry rock and into the river. This happened to me and hiking 5km with one wet foot is not fun. The beach along Lake Nordenskjold is a great place to stop for lunch. Looks like a Maldives beach with Swiss mountains combined. Unbelievable. We were pretty sore from the previous day’s hike, so we relaxed and ate dinner upon arriving to Camp El Frances. The Domos at this camp site was the “glamping” (glamorous camping) portion of our trip. The facilities seemed relatively new when we arrived. These domes reminded me of a hostel because there were 4 bunk beds in one giant room (8 people total), but the perk is that there is a bathroom/shower in each dome. Also, you don’t have to unzip your tent and walk outside with a flashlight to go pee! I was really impressed that they had such good quality food at this site because it’s not an easily accessible location. It must be crazy difficult to deliver food to Camp El Frances because you can’t drive a truck or take any sort of motor transportation through the trails. Day 3 consisted of hiking from Camp El Frances up through Valle del Francés and back for a total of 17km. Since we were staying in the same campsite for two nights, we did not have to carry our bags during this hike. Valle del Francés is without a doubt is the most beautiful valley I have ever seen! Experiencing all four seasons in one day is a common experience in this part of the world. The beginning of this trek started very cold and rainy with hats, gloves, and rain jackets being worn. However, toward the end of the hike it was perfectly sunny and warm. Wearing layers is an absolute must! You will constantly be adding and subtracting layers throughout the day while on the W-Trek. As we walked through the valley, we heard something that sounded like loud thunder or explosions. Turns out it was a steep mountain was experiencing several avalanches nearby. Luckily, the avalanches were a safe distance away. The hike into Valle del Francés is on an incline, however its not too steep compared to the day one hike to Las Torres. Plus, the area is so insanely beautiful you’ll forget your even hiking. The trail was a bit rocky and towards the top, so you definitely need to do a bit of climbing. The scenery was quite breathtaking with the rivers and the glaciers interrupting the hike. When you get to the top, you have a 360 degree view of the mountain “skyline.” We were happy that the sun made an appearance to showcase these magnificent views. The walk down was a lot easier than walking up. It was quite a relief that it stopped raining because the rain can make the rocks pretty slippery. The longest hike of the trip came on day 4, with a distance of 32km. Ideally, this should have been broken up into two separate days, but I didn’t have enough time stay in Patagonia for an additional day. Even though this hike was the longest distance, it was pretty easy because it was relatively flat most of the way. This hike starts at Camp El Frances, stops at Camp Paine Grande, heads to Grey Glacier, and then ends back at Camp Paine Grande. Once we reached Camp Paine Grande, we checked-in and dropped off our bags. That way we could hike to Grey Glacier without carrying anything. The first half of the hike had towering mountains on one side and insanely colored azure lakes on the other. The flat trails and beautiful scenery made this one of the easiest parts of the W-Trek. Along the way you’ll see a few lakes, but when you get closer to the campground, Lake Pehoe has a more vibrant shade of turquoise compared to what was seen at the top of Los Torres. We wanted to hike to Grey Glacier that same day, so we immediately dropped off our heavy bags in our assigned tent after checking in. After dropping off our bags, we proceeded to Grey Glacier, which was about 11km away. This part of the hike was a bit more steep, windy, and cloudy. Several large lakes surround the W-Trek, each with their own distinctive color. On the way to Grey Glacier, the trail hugs Grey Lake, named after its color and for being fed by Grey Glacier. Grey Glacier was huge, but the weather wasn’t super cooperative. By the time we got there, it was really foggy. A bit disappointing, but can’t really complain since we had pretty phenomenal weather for most of the day. After seeing Grey Glacier, we turned around and headed back to Paine Grand Campsite for dinner. There is a restaurant located at this campsite and it was absolutely packed. The campsite itself was a lot louder than the other sites, but I think the campsite serves as a hub for many travelers. Many people start the W-Trek here, while others end here, like we did. It’s a big noisy campsite and you’ll here people chatting throughout the night. Being right next to the Catamaran pier, Camp Paine Grande is was a good campsite to end the trek. After a night of howling wind, we woke up early, had breakfast, packed up our belongings, and headed to the dock for the Catamaran. The Catamaran crosses Lake Pehoe and goes from Campsite Paine Grande to Pudeto, where buses are waiting to take us to Puerto Natales. From Pudeto, we bought bus tickets to ride back to Puerto Natales. There were a ton of buses (we took a bus called, Bus-Sur) and I think they all run in sync with the Catamaran schedule. The buses seemed to be waiting for the crowd of people to get off the boat. We bought tickets directly from the bus driver with the ride taking about 5 hours. After we arrived at Puerto Natales, we took another bus to Punta Areanas. Finally, once we arrived to Punta Areanas, we flew back to Santiago. In conclusion, the W-Trek in Patagonia is a challenging epic hike in one of the most remote places in the world. With unparalleled beauty and awe inspiring sights, all the planning and time involved to get to this location is well worth the effort. Highly recommend staying at Refugio grey a night (or two) so that you have time to hike past the camp & out to the bridges and hike the glacier! One of my favorite days doing the trek. one of my favorite places in the world, gorgeous. As far as treks go, I’d say the hike is actually pretty easy though. The elevation is low and the inclines are modest. Plus, there are many refugios and amenities.